My favorite mini cheesecakes! 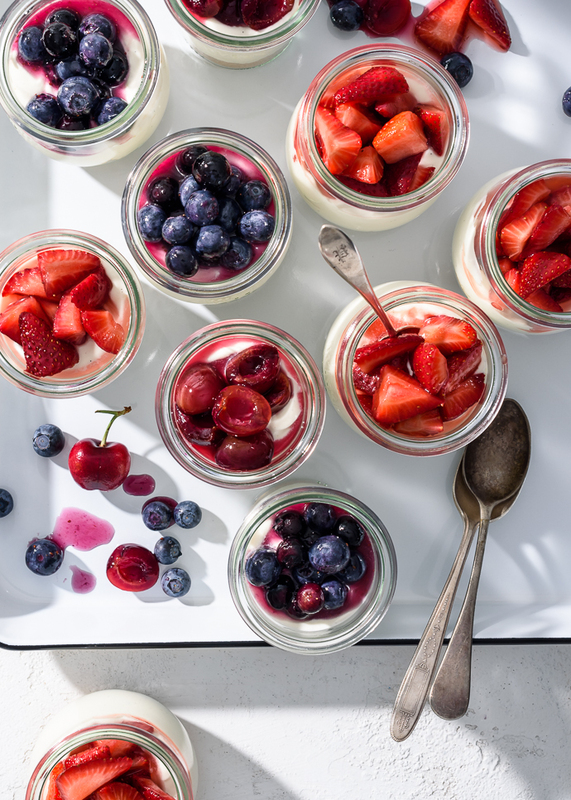 All the flavors of traditional cheesecake – a brown sugar graham cracker crust, creamy and indulgent mascarpone cheesecake filling, and a sweet fruit topping – combine for an easy, delicious, and crowd-pleasing no-bake Summer treat. When it comes to back pocket desserts, these no-bake mascarpone mini cheesecakes are an easy favorite. 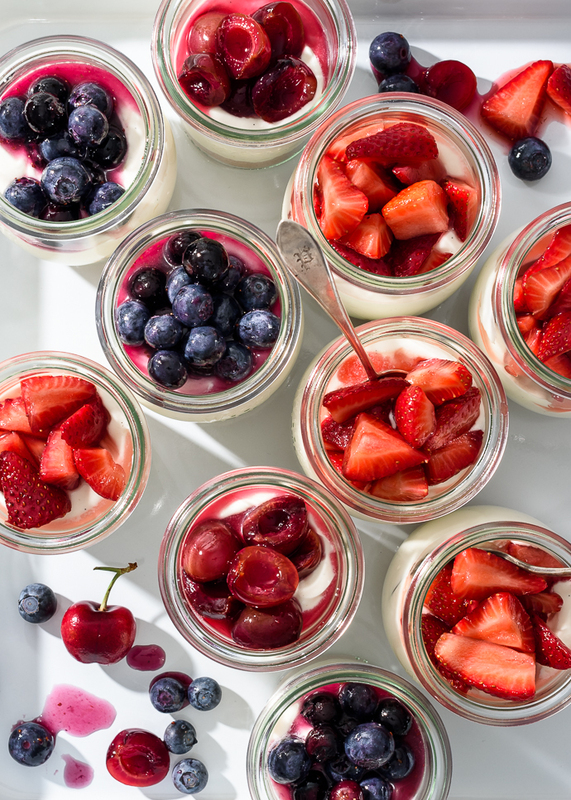 These sweet cheesecake jars check off a lot of boxes: they’re a breeze to make (in advance), but still feel a little bit fancy thanks to ultra-creamy Italian mascarpone cheese. They can be adapted to the season with any number of different toppings – think macerated berries in Spring, stone fruit and syrupy figs in late-Summer, homemade caramel in the Fall… – and most important, are delicious, and can be counted on to please a crowd. 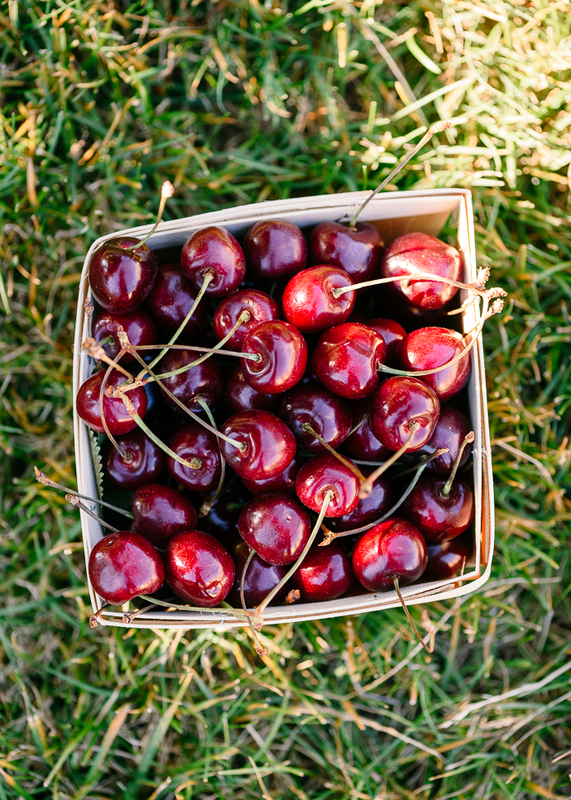 And these red, white, and blue babes would look real’ pretty as part of a Memorial Day or 4th of July barbecue spread. Because these mini cheesecakes are no bake, they’re perfect for those hot and languid Summer days where the last place you want to be is standing in front of an oven. The mascarpone, an Italian cream cheese, while most commonly known as the key-ingredient in tiramisu, layered between ladyfingers and cocoa and espresso, is equally well-suited to cheesecake. Incredibly creamy on its own, when combined with fragrant vanilla bean paste, fresh lemon zest, and folded into whipped cream, the lusciously fluffy results are pure decadence. And yet, so easy. The method couldn’t be simpler. I kept the base for these mini cheesecakes traditional, and went for a tried-and-true, brown sugar-sweetened, cinnamon-kissed graham cracker crust. Followed by the dreamy mascarpone cheesecake filling, and a spoonful of ambrosial, macerated cherries, strawberries, and blueberries floating on top, they’re all kinds of heavenly. And on a final note, while these red, white, and blue mini cheesecakes may be oh, so festive for Memorial Day, I hope that you’ll join me in taking a few somber moments in the midst of enjoying your long weekend – and delicious eats – to remember what the day is about: those who have made the ultimate sacrifice in service to our country. My favorite mini cheesecakes! This easy, no-bake recipe is a lovely choice for a fun and festive summer dessert. 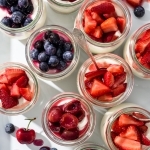 All the flavors of traditional cheesecake – a brown sugar graham cracker crust, creamy and indulgent mascarpone cheesecake filling, and a sweet fruit topping – combine for a delicious and crowd-pleasing Summer treat, without the fuss. Make the base: Use a food-processor to pulse together the graham crumbs, brown sugar, salt, and cinnamon. Drizzle in the melted butter and pulse a few times until combined. Divide the base between your jars or serving dishes. Press down gently into an even layer. Set aside. Make the mascarpone filling: Add the cold cream to the (chilled) bowl of a stand up mixer fitted with the balloon whisk attachment. Starting on low speed, and gradually increasing, beat the cream until soft, fluffy peaks form. Transfer the whipped cream to a separate bowl. Add the softened mascarpone and sugar to the mixing bowl, and beat together until light and creamy and no lumps remain. Beat in the vanilla and lemon zest. Use a spatula to gently and methodically fold the whipped cream into the mascarpone mixture until combined. Divide the mascarpone cheesecake filling between the jars. It may be easier to fill a large pastry bag and pipe the filling into the cups. Refrigerate until ready to serve. Make the topping and assemble: Stir together the chopped fruit with the sugar and lemon juice. Let sit for at least 30 minutes. Top the cheesecake with the fruit and syrup shortly before serving. ¹ Mascarpone cheese can be found in most well-stocked grocery stores. If you cannot find it, traditional brick cream cheese is a perfectly good substitute. Be sure your mascarpone cheese is fully softened to room-temperature for the creamiest, lump-free results. Looks beautiful and delicious! I make one with regular cream cheese. 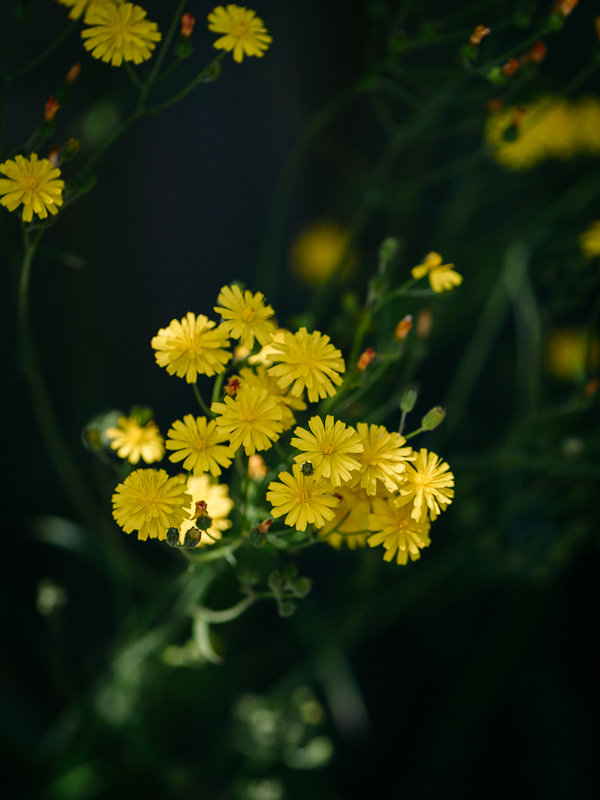 It is one of our family’s very favorites. I’m really excited to make these with mascarpone – which I love – and wonder why I didn’t think of that! Also, where might I find those adorable little glass (plastic?) dessert jars? Thank you for this recipe, Laura! Thank you so much, Cyndi!! They’re one of our favorites too (and I often make them with regular cream cheese!). The glass jars are made by Weck. I have a couple different sizes of them – the ones in the pictures are a mix of the tulip jars: https://amzn.to/2Juld46, and the mini mold jars: https://amzn.to/2Lqn4E2. Wow – thank you, Laura!! I’m off to order some jars! Super excited to make these – thank you again :). I made these! I ordered three boxes of six Weck tulip jars. I used two 475 g containers of mascarpone and a little over four cups of whipping cream. I followed the recipe exactly, and I can’t even describe the raves I got! Organic cane sugar is wonderful to work with. The filling turned out beautifully with the softened mascarpone and I was delighted to find that the amount I made filled all 18 jars perfectly! The topping was so pretty and delicious. The ONLY challenging part, and it wasn’t even that challenging, was pressing the base onto the bottom of the little jars. I used a large whisk that has a handle with a round, flat bottom. So with the whisk pointed straight upward, I was able to gently press the base into the jars with the flat bottom of the handle. This worked great if a little tedious, but if you have any suggestions for doing this, Laura, I would welcome them! Instead of piping the filling, I just gently spooned it into the jars, and that actually looked very pretty! Everyone absolutely loved these. My son has already requested them for his birthday dessert! Thank you again, Laura, for this fantastic recipe. I am thrilled to hear that they were such a success!! These are a family favorite around here too. I’m also glad that they filled those little tulip jars so well. Aren’t they cute? I agree it’s a bit challenging to press the crust into the bottoms of those little guys. Larger jars are definitely easier (and faster), but I use essentially the same method you did, and just know it’ll take a little longer because of the shapes of the tulips. Thanks so much for your comment, Cyndi!! This looks like the perfect red, white and blue dessert for Memorial Day (and 4th of July, too). Thanks also for mentioning what Memorial Day is all about. I’m certainly on board with enjoying the three-day weekend as a kickoff to summer. But as you say, it’s also a time to reflect on the sacrifice that so many soldiers have made, and continue to make, for our country. Hope you like these, Patty! Though you make a mean cheesecake yourself… 😉 Not sure why the bloglovin’ function wasn’t working – I’ll look into it! They look so Yum! Would surely try it this weekend, Thanks for sharing the recipe. Thanks, Louis!! Hope you enjoy these as much as we do! I was wondering if these would be fine to make into one large cake as opposed to several individual cups? Would it be firm enough to stand on it’s own? Thanks. Hi Brittany! These little cheesecakes are pretty soft, so they won’t be slice-able as one large cheesecake. If you really want to go that route, you could try freezing it? The texture will be a little bit different but it will be more solid that way (just thaw slightly before serving). I’ve also made this filling in mini 4-inch tart pans. Hope that helps! !